Transform your leftover casserole into Sweet Potato Casserole Muffins. 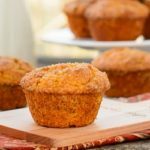 These homemade flavorful muffins are a wonderful way to start the day. Cream butter and sugar in a large bowl until light and fluffy. Add eggs, one at a time, beating well after each addtition. Add sweet potato casserole filling and milk and beat until combined. Whisk together flour, baking powder, salt, cinnamon (if needed), and nutmeg in a separate bowl. Add to creamed mixture and stir until just moistened. Stir in pecans. Stir together sugar and cinnamon. Sprinkle on top of batter. Bake for 22 to 25 minutes, until golden brown and a toothpick or cake tester inserted in the center comes out clean. Remove muffins from pan. You may need to run a knife between the muffins and the pan to loosen the edges from the pan. *You can make these muffins with plain baked and mashed sweet potatoes. If you do then increase the cinnamon in the batter to 1 teaspoon. **Use your judgement on how much cinnamon to add based the cinnamon flavor/seasoning of your sweet potato casserole filling.